¡It is important to know, Monitor Call can't cut the Call or make redial. ! ¡To count the time of the call, Please don't press the button to block the screen of your cellphone! LIMITATIONS IN THIS FREE VERSION. 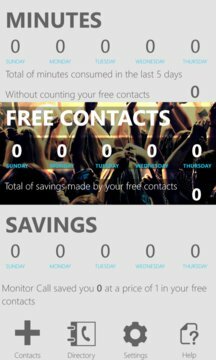 5 calls per day to your free Numbers. Do not go over your plan and take advantage of free minutes you have your free numbers. More than 100,000 users support the functionality of Monitor Call. Monitor Call is the only application capable of measuring the duration of your call. We'll alert you to hang up before reaching the free minutes from your free numbers. You can see your consume in your Live Tile. Pin to Start your free numbers. Pin to Start your normal numbers. Monitor call has the hability to show you details of your consume with graphics. Monitor Call is faster and very stable :). Receive personalized support directly from the developer. We also develop applications for Windows Phone, if you are interested please send an email to the support email.